The New York Yankees head to Minute Maid Park on Friday, June 30, 2017 to take on the Houston Astros. The expected starting pitchers are Michael Pineda for the Yankees and Lance McCullers for the Astros. The odds for this matchup have New York at +140 and Houston at -150. The Yankees have a 44-32-0 over/under mark and a 42-34-0 run line record. The Astros are 47-32-0 against the run line and have a 39-34-6 over/under record. The Yankees have a 42-34 overall record this season. Starting pitcher Michael Pineda has a 7-4 record with an earned run average of 4.12 and a WHIP of 1.23. He has 88 strikeouts over his 87.1 innings pitched and he's given up 87 hits. He allows 9 hits per 9 innings and he has a FIP of 4.41. The bullpen has an earned run average of 3.55 and they have given up 191 base hits on the year. Teams are hitting .210 against the bullpen and they've struck out 276 hitters and walked 107 batters. As a team, New York allows 8 hits per nine innings while striking out 9.5 batters per nine innings. They are 4th in the league in team earned run average at 3.87. The Yankees pitchers collectively have given up 601 base hits and 289 earned runs. They have allowed 91 home runs this season, ranking them 20th in the league. New York as a pitching staff has walked 228 batters and struck out 706. They have walked 3.1 men per 9 innings while striking out 9.5 per 9. They have a team WHIP of 1.23 and their FIP as a unit is 3.92. As a team New York is hitting .269, good for 3rd in the league. The Yankees hold a .459 team slugging percentage and an on-base percentage of .345, which is good for 2nd in baseball. They rank 3rd in MLB with 9.4 hits per game. Aaron Judge is hitting .333 with an on-base percentage of .447. He has 88 hits this season in 264 at bats with 60 runs batted in. He has a slugging percentage of .697 and an OPS+ of 194. Starlin Castro is hitting .313 this year and he has an on-base percentage of .348. He has totaled 92 hits and he has driven in 45 men in 294 at bats. His OPS+ is 116 while his slugging percentage is at .486. 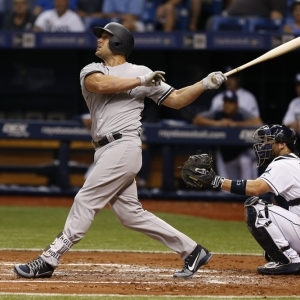 The Yankees have 707 hits, including 120 doubles and 120 home runs. New York has walked 292 times so far this season and they have struck out 669 times as a unit. They have left 554 men on base and have a team OPS of .804. They score 5.56 runs per contest and have scored a total of 417 runs this year. Houston has a 53-26 overall mark this year. With an earned run average of 2.53, Lance McCullers has a 7-1 record and a 1.04 WHIP. He has 97 strikeouts over the 81.2 innings he's pitched. He's also given up 62 hits. He allows 6.8 hits per nine innings and his FIP stands at 2.75. The bullpen has an earned run average of 3.89 and they have given up 216 base hits on the year. Teams are hitting .211 against the Astros bullpen. Their relievers have struck out 349 batters and walked 95 opposing hitters. As a team, Houston allows 7.8 hits per nine innings while striking out 10.1 batters per nine innings. They are 3rd in the league in team earned run average at 3.8. The Astros pitchers as a team have surrendered 609 base knocks and 297 earned runs this season. They have given up 89 home runs this year, which ranks 22nd in Major League Baseball. Houston as a staff has walked 238 hitters and struck out 788 batters. They give up a walk 3 times per 9 innings while they strike out 10.1 per 9. Their team WHIP is 1.21 while their FIP as a staff is 3.69. As a team, they are batting .280, good for 1st in the league. The Astros hold a .481 team slugging percentage and an on-base percentage of .347, which is good for 1st in baseball. They rank 2nd in MLB with 9.7 hits per contest. Carlos Correa comes into this matchup batting .303 with an OBP of .384. He has 84 hits this year along with 48 RBI in 277 AB's. He maintains a slugging percentage of .516 with an OPS+ of 147. Jose Altuve is hitting .324 this season and he has an OBP of .396. He has collected 95 hits in 293 at bats while driving in 36 runs. He has an OPS+ of 152 and a slugging percentage of .522. The Astros as a unit have 756 base hits, including 153 doubles and 125 homers. Houston has walked 254 times this year and they have struck out on 532 occasions. They have had 535 men left on base and have an OPS of .828. They have scored 5.49 runs per game and totaled 428 runs this season. Who will win tonight's Yankees/Astros MLB game against the spread?